Summoned to Las Vegas by the one and only Wayne Newman when his show girls keep disappearing, James Rufus aka Hurricane, along with his new love, Janice Jenkins, whom he Affectionately calls “Tornado,” arrive in Las Vegas for a combination of work and play, or so they thought. Sam’s investigation soon escalates to a fever pitch when Janice goes missing and he learns what is in store for the kidnapped girls. Racing against the clock, Hurricane accepts the help of his Shoshone blood brothers in trying find and rescue the girls before its too late. Just when they believe the top man is within reach, new evidence surfaces revealing connections in high places across international lines. Hurricane has no choice but to accept the help of Janice and some of the other rescued ladies to end the reign of terror and slavery. $13.25 including shipping & handling for USA only. When you buy form Authorjc.com website. Limited time offer. Autographed copies at your request, contact us for more information. 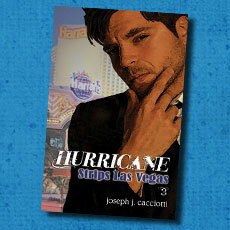 I’m Joseph J. Cacciotti pronounced (Ca-Shot-ee) I've always been a fan of Action/Adventure movies and books and after reading many books by some very good writers. I decided to do something different than the rest. All rights reserved. All character and events in these books are completely fictional and a product of the author's own imagination.